The Inman aligner is a fast, effective and convenient method of straightening the front teeth. It has become the main treatment for adults who have suffered orthodontic relapse and require smile alterations. 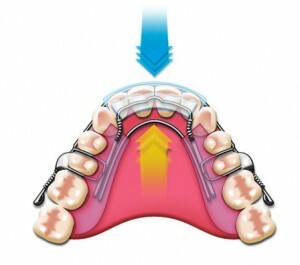 Treatment works through the generation of forces to move the teeth into the correct position. The appliance is made from two key parts, a coiled spring and a fine metal bar. The spring is positioned behind the front teeth, while the metal bar runs along the front of the teeth – the two parts create forces to effectively push and pull the teeth into position. The appliance is a custom-made orthodontic appliance and uses the latest advanced technology to move the teeth quickly, creating a straighter smile in a matter of weeks, without any pain or hassle. In the past, people with crooked teeth had very few choices in terms of treatment options. For example, fixed braces can take a long time to produce results and can be fairly expensive. Now, however, patients have an effective, quick alternative in the Inman aligner. Treatment results can be achieved within 16 weeks and there is no need for brackets or wires. You are also free to remove the appliance to eat, drink and clean your teeth. Cost-effective: the Inman aligner is a cost-effective alternative to invisible braces. Ease: all you have to do is wear the appliance for a set period of time and then enjoy the results. Speed: the Inman aligner works quickly, producing incredible results in just 6-16 weeks. Flexibility: the Inman aligner is removable, giving you greater flexibility, allowing you to eat and drink what you want and facilitating good oral hygiene. During the initial consultation the dentist will examine your mouth closely and take photographs to determine if you are a suitable candidate for Inman aligner treatment. Your dentist will also talk to you about the treatment process and answer any questions you may have. Your dentist will discuss the treatment in detail with you and talk about your expectations. They will also analyse your smile in great detail and take a closer look at your gums, teeth and bite. Impressions of your teeth will be created and sent away to the laboratory for manufacturing. The photographs and impressions will also be used to create your unique treatment plan. When the Inman aligner is ready, it will be fitted and treatment can begin. Treatment is usually complete within 6-16 weeks and your dentist will talk to you about looking after your teeth, caring for the appliance and answer any questions you have. Can I eat and drink when wearing the Inman aligner? The Inman aligner is removable so you can take the appliance out to eat and drink. This saves food from getting trapped and prevents the braces from being damaged. It may take a couple of days to get used to wearing the Inman aligner, but the appliance has been developed with comfort in mind and you should not experience any pain during the treatment process. Your speech may be mildly altered for the first couple of days, but this will soon return to normal. Is it simple to clean your teeth properly with the Inman aligner? The Inman aligner is removable so you take your braces out to clean your teeth. This means that you can brush thoroughly and floss and rinse normally. The Inman aligner is cheaper than many other orthodontic treatments. Inman aligner treatment is available from £1750 and this includes the initial consultation (when treatment is begun the same day), photographs, impressions, treatment planning, the actual treatment and follow-up care.